Without an Italian Garden and without an atmosphere of Italy about him he could not live. Italy is in his blood, and when he goes to his delicious villa in Sorrento I don’t doubt he is more at home than in his Tudor castle, except that he cannot gather about him so many friends. From George W. Smalley, Anglo American Memories. 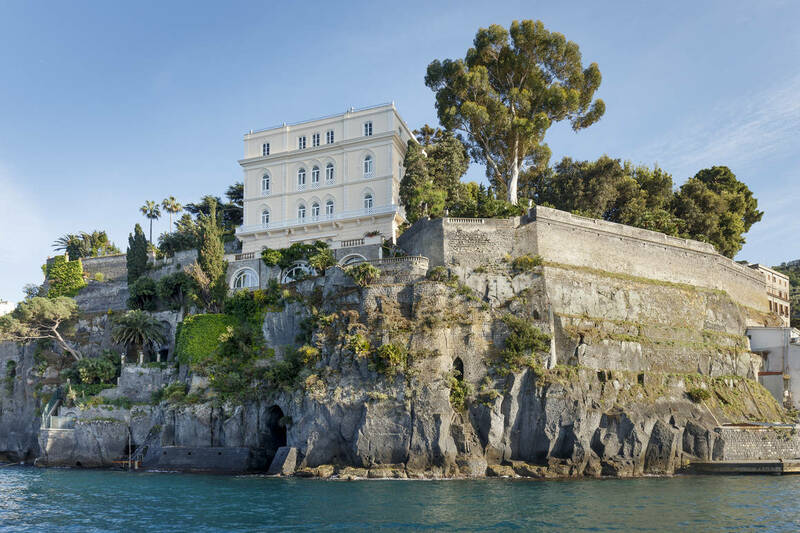 Villa Astor, is a newly restored villa on the Amalfi coast, named after William Waldorf Astor, the wealthiest and extravagant American in the world. After the frigid temperatures that the US has experienced in the past weeks it is very understandable how one of the most eclectic and wealthy Americans was excited to spend his winters in the warmth of Sorrento. Mr. Astor purchased the Villa and the surrounding land in 1905. 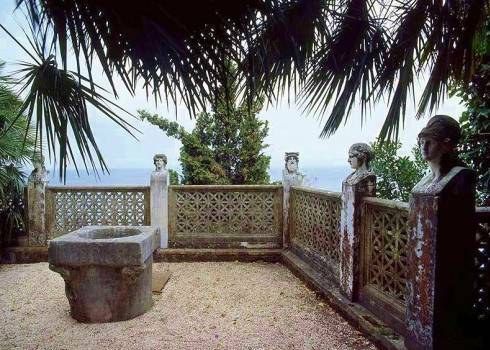 The villa is located in one of the most spectacular view point of the Amalfi coast, inserted between Sorrento and Capri, the lush gardens spill down the rocky promontory dominating the bay of Naples. While restoring the main house William Astor purchased the adjoining property and the nearby monastery of S. Vincenzo to further expand the property and its gardens. In 1910 he also added the piece of land between his villa and the nearby Syrene Hotel, one of the jet set’s favorite hotels of the area. With such an extraordinary piece of land and its unique location, William wanted to add an extension to the villa so he designed a replica of a Pompeian villa that he later called Villa Florus, connected to his main garden through a long peristyle of iconic columns. 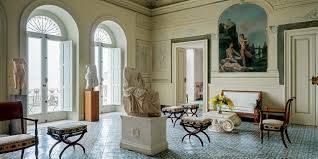 Villa Florus was also decorated with artifacts pieces found in the Pompeii region. 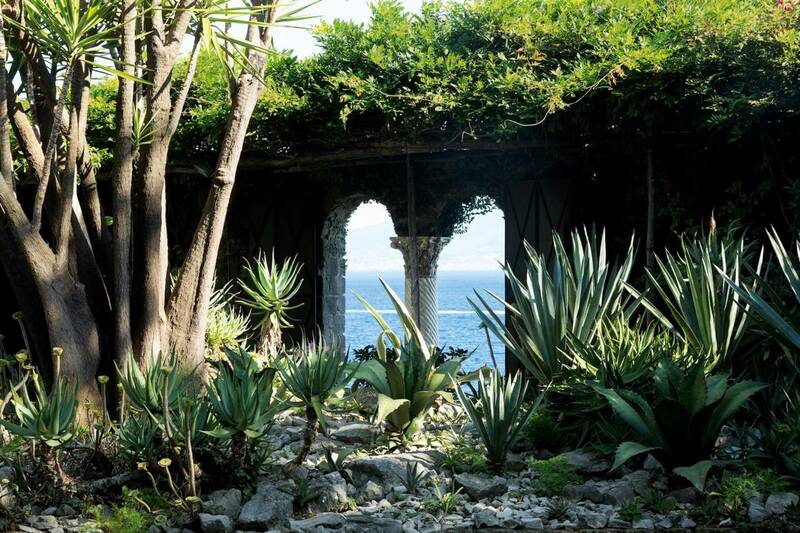 Mr. Astor, created an exceptionally elaborated botanical garden around his villa, adorned with a multitude of classical and renaissance sculptures. The garden’s wall protecting the numerous species planted in the gardens from harsh climate, are decorated with fragments of antique columns, statues and urns. 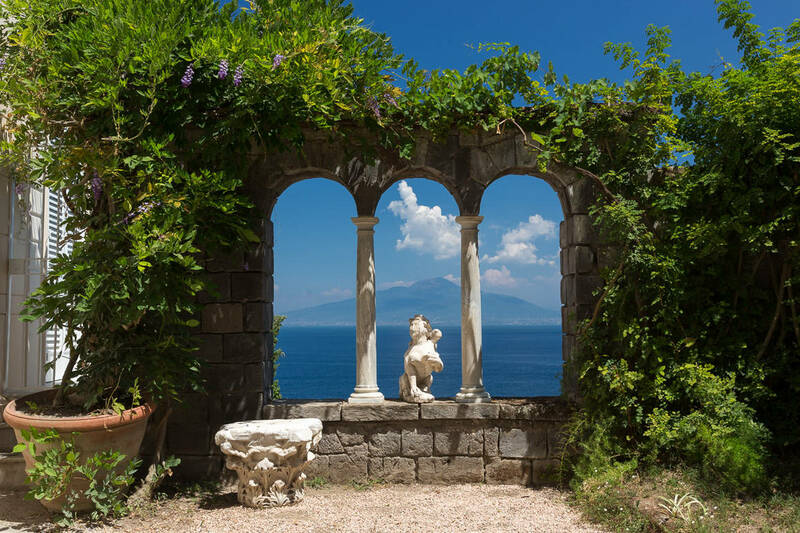 Arched openings are strategically inserted in the walls to offer spectacular views of the Mediterranean Sea framing the marvelous nature of Vesuvius. The garden spreads over seven acres of olive and orange orchards. 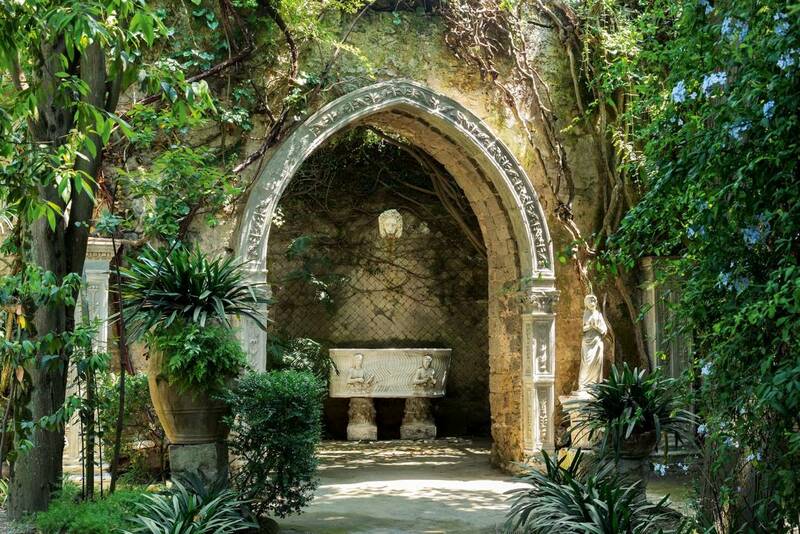 Monuments and vegetation intersected in the long alleyways and narrow paths that crisscross the property, shaded by pergolas were giant fragrant Wisteria intertwines, there is a multitude of palm trees, mimosa trees and dense flowering shrubs. William Astor, was spending the winter months in this remarkable property until 1919, the year of his death. The Italian government declared this place protected, for its intrinsic artistic value. Thankfully the villa survived the intense bombing of WWII. It was purchased by the shipping magnate Mariano Pane. Under the new ownership the property became one of the most glamorous and popular spot. 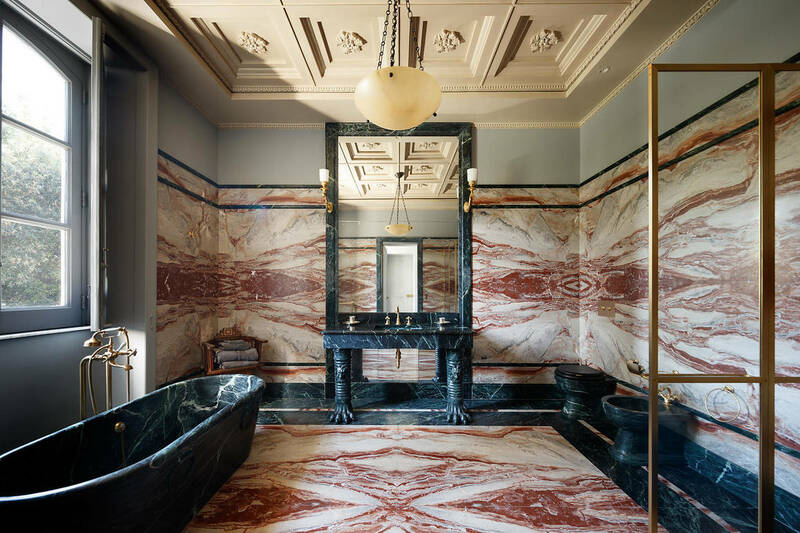 After the last purchase in 2012, the new owners commissioned renowned French designer Jacques Garcia, to restore the villa to its original splendor. 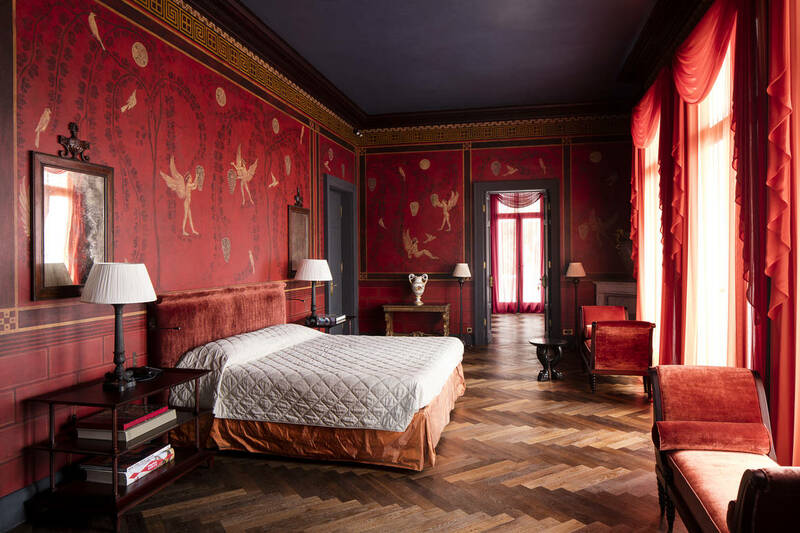 Garcia, is known for his ability to restore historical rich interiors, like palace of Versailles, and other important masterpieces in Italy and France. He was perfectly able to bring back the exquisite interiors to their original splendor, utilizing the intense collection of antique pieces scattered in the entire property. He preserved the beauty of the past while bringing this space into the modern contemporary age. 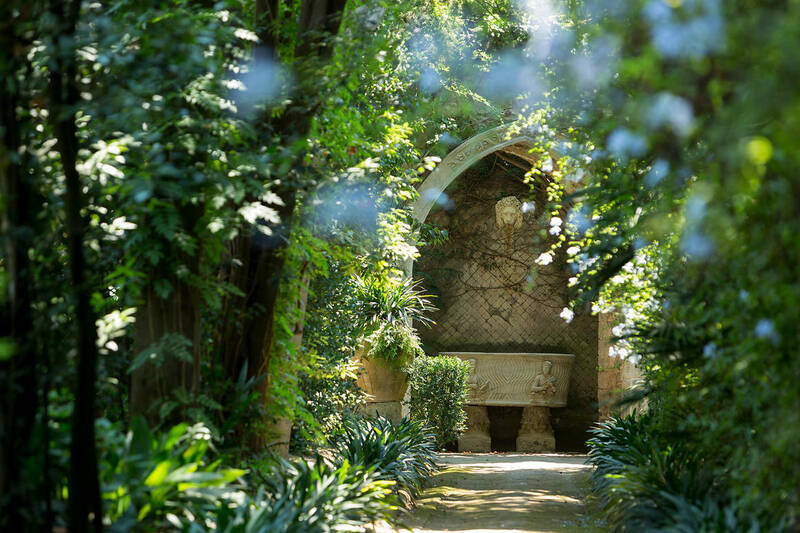 After more than 100 years later, the poetry of the place, the romantic feeling of the antique ruins and stone elements of the garden are well preserved as a botanical garden, a source of pleasure for visitors from all over the world. To celebrate the magnificent villa, a beautiful book about the history of this place has been published, with beautiful photos illustrating the before and after. 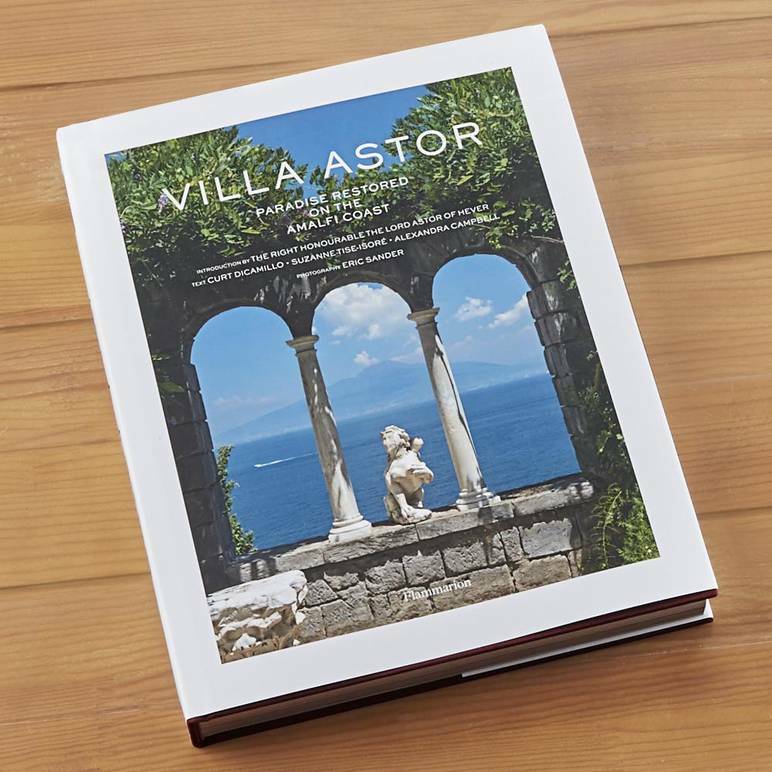 Villa Astor – Paradise Restored on the Amalfi Coast, Flammarion publishing. Today the villa can be rented for private events.